BP's $4 Billion Criminal Penalty: Who Gets The Money? : The Two-Way The bulk will go to the National Fish & Wildlife Foundation, the National Academy of Sciences and at Coast Guard trust fund. The foundation focuses on wildlife conservation and the academy advises the government on science and technology. 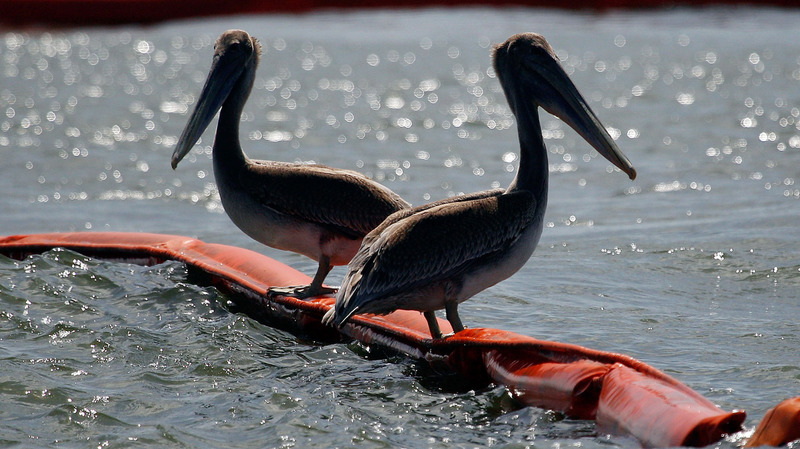 July 2010: Two pelicans sit on booms protecting Queen Bess Island, La., from oil that spilled after the Deepwater Horizon rig exploded in April. "Under the resolution with the Department of Justice (DOJ), a total of $2.394 billion will be paid to the National Fish & Wildlife Foundation (NFWF) over a period of five years. In addition, $350 million will be paid to the National Academy of Sciences (NAS) over a period of five years." -- "An independent 501(c)(3) chartered by Congress in 1984. -- "One of the nation's largest non-profit funders for wildlife conservation. -- "Governed by a 30-member Board of Directors approved by the Secretary of Interior (includes the U. S. Fish & Wildlife Service Director and NOAA Administrator)." "We provide grants on a competitive basis to protect imperiled species, promote healthy oceans and waterways, improve wildlife habitat, advance sustainable fisheries and conserve water for wildlife and people. Since its establishment [in 1984], NFWF has awarded over 11,600 grants to more than 4,000 organizations, leveraging $576 million in federal funds into more than $2 billion for conservation through our partnerships. "Additionally, NFWF serves as a neutral, third-party fiduciary to receive, manage and disburse conservation funds arising from legal and regulatory proceedings. Most often these funds originate from court orders, settlements of legal or administrative cases, regulatory permits, licenses, or conservation and mitigation plans. The funds are managed under NFWF?s Impact-Directed Environmental Account (IDEA) program. NFWF works collaboratively with government and the private sector to ensure that funds are spent effectively and transparently on conservation and restoration projects." "Is a private, non-profit society of distinguished scholars engaged in scientific and engineering research, dedicated to the furtherance of science and technology and to their use for the public good. "An Act of Congress, signed by President Abraham Lincoln in 1863 at the height of the Civil War, calls upon the NAS to provide independent advice to the government on matters related to science and technology." Update at 2:25 p.m. ET. More Details On Where The Money Will Go. More than $1 billion will go to the U.S. Coast Guard's Oil Spill Liability Trust Fund, to be available for cleanup – and compensation for those affected by – oil spills in the Gulf and throughout the United States. Holder also said that $1.25 billion of the $4 billion associated with criminal misconduct is considered to be a "fine" and that it's the "single largest criminal fine" in U.S. history. The $4 billion total, which includes that fine and which he referred to as a "criminal resolution," is also a record, Holder said.